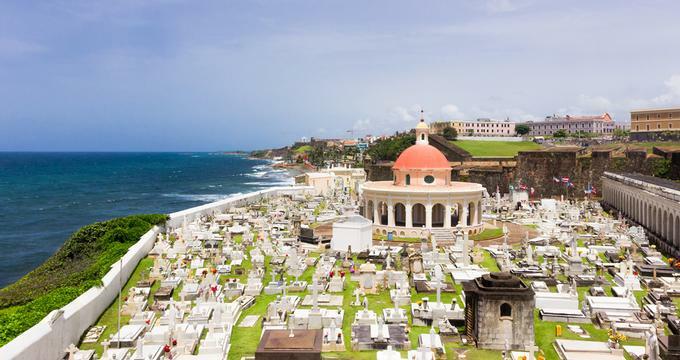 The winter season is the busiest tourist time in San Juan. This is the time that the city sees its best weather and many people visit in order to escape the cold weather back home. 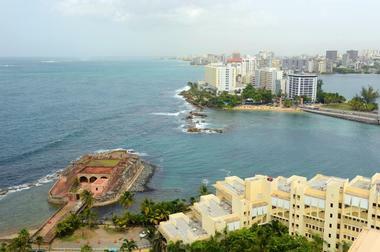 San Juan can become very crowded in the winter and hotels raise their room rates. Occasionally, you can find a good deal on a room during the peak season. Summer is the rainy season so this is not a popular time to visit. Spring is the best time to visit - the weather is balmy between mid-April and June, the city is far less crowded, and hotel room rates are more reasonable than during the peak winter season. January is the coolest month of the year in the tropical locale of San Juan, Puerto Rico. The average high temperature measures in at 81°F (27°C). The average low temperature is a mild 70°F (21°C). San Juan Weather in February: The rainfall in February is 69 mm making it the driest month of the year. The average high temperature holds steady at 81°F (27°C). However, the average low temperature increases by 2 degrees to 72°F (22°C). In March, high temperatures increase by a single degree to 82°F (28°C). On the other hand, the low temperature average remains the same at 72°F (22°C). April’s temperatures remain at 72°F (22°C) for the average low temperature and 82°F (28°C) for the average high temperature. With the temperatures comfortably warm, April is the last month of San Juan’s peak tourist season. San Juan Weather in May: Temperatures continue its upward trend in May with the high temperature reaching 84°F (29°C). The low temperature average climbs a single degree to 73°F (23°C). In June, the average high temperature peaks at 84°F (29°C) while the average low temperature hits 75°F (24°C). July sees bright and sunny days with 9 hours of sunshine per day. The long days are matched by an average high temperature of 84°F (29°C) and an average low temperature of 75°F (24°C). 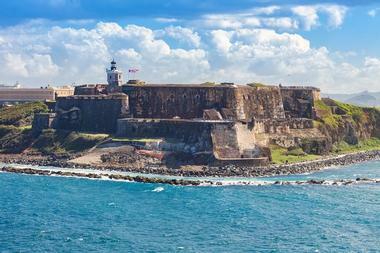 San Juan Weather in August: The heat is on for August as high temperatures climb to 86°F (30°C). With the low temperature average at 75°F (24°C), August holds the record for the hottest month of the year. In September, the precipitation levels get quite high with 139 mm of expected rainfall. The average high and average low temperatures hold steady at 86°F (30°C) and 75°F (24°C) respectively. October retains the same temperature averages at 86°F (30°C) for the average high temperature and 75°F (24°C) for the average low temperature. San Juan Weather in November: The rainiest month of the year for San Juan comes in November when the expected rainfall is at 157 mm. The average high temperature decreases a couple of degrees to 84°F (29°C) while the average low temperature goes down the same amount to 73°F (23°C). In December, the average high temperature decreases ever so slightly to 82°F (28°C). The average low temperature decreases by a single degree to 72°F (22°C). The days remain quite sunny with 8 hours of daily average sunshine. In general, the best time to visit Puerto Rico is from mid-April to June when the very busy winter season comes to an end and just before the rainy season starts. However, for travelers who wish to come when the weather is at its best, the most ideal time to visit is during the winter months of mid-December through mid-April. The most affordable time to visit Puerto Rico is between mid-April to June while July to September has the least volume of tourists. Most people arrive in San Juan by airplane. The Luis Munoz Marin International Airport is San Juan and Puerto Rico’s main airport: it is commonly referred to as the San Juan International Airport. It is located in the town of Carolina, just several miles west of San Juan. One of the largest airports in the Caribbean, this airport welcomes visitors from 50 countries. It also serves as a hub providing connecting service to other smaller islands in the Caribbean and in Latin America. As Puerto Rico is an island, the only other way to get there is by sea. The Port of San Juan is the second biggest cruise ship port in the Western Hemisphere. To get from the Luis Munoz Marin International Airport into the city of San Juan, you have several options. There are many car rental agencies: there are kiosks at the airport and shuttle buses take you to your rented car. If you don’t have much luggage, the least expensive way to get into San Juan is to take city bus: you must change buses a few times before you reach your destination, but it is very inexpensive. Publicos, or public cars, are shared vans that are inexpensive but might take longer to get into the city than other forms of transportation. There are also many taxi and limousine companies at the airport. The Puerto Rico Tourism Company has a tourist information center at the Luis Munoz Marin Airport. This is a great service to use: you can learn everything you need to know before you even leave the airport! Friendly staff will answer your questions about what to see and do, where to shop, where to eat, where to sleep, how to get into the city and then how to get around the city. The same company operates a tourist information center at La Casita. This is near the Plaza de la Darsena in Old San Juan close to Pier 1 where the cruise ships arrive. One of the ways to get around San Juan is by bus. The Puerto Rico Metropolitan Bus Authority runs a good bus system. The bus terminal is located next to the Treasury Department. Bus stops are marked with yellow posts that say “Parada.” Getting around San Juan by bus is inexpensive, comfortable, convenient, and reliable. There can be some confusion over bus route numbers, bus route maps, and bus schedules, so the most important thing to remember is the bus route number. The bus authority is working on fixing this situation. It’s not a bad idea to ask questions before boarding. 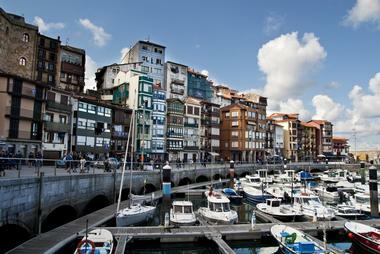 The most popular tourist buses are 5, 21, and 53. If you want to see San Juan by car, you can visit one of the many car rental kiosks at the Luis Munoz Marin International Airport. This way you can get from the airport into the city by car as well as get around the city. You can also rent a car at the Sheraton Old San Juan Hotel: this is a conveniently located car rental agency close to the piers from which passengers disembark from cruise ships. There are several other car rental locations in San Juan. You can park for free on the street if you get there early enough; otherwise plan to pay for parking in one of the secure lots or garages. The Tren Urbano, or Urban Train, is a rapid transit train system and is the first of its kind in the Caribbean. It is fully automated and covers about 11 miles: trains travel at about 55 miles per hour and the system is used by more than 40,000 passengers every day. It is a safe, affordable, reliable, and efficient system. During rush hour trains run every eight minutes; outside of rush hours trains run every twelve minutes. 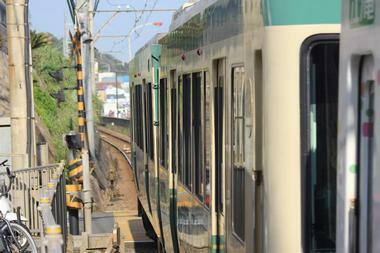 The trains go to many suburbs in the greater San Juan metropolitan area, but visitors will find it useful to travel through the most congested parts of the city. Traveling by bike is a great way to explore San Juan and can be enjoyed by all the members of your family. 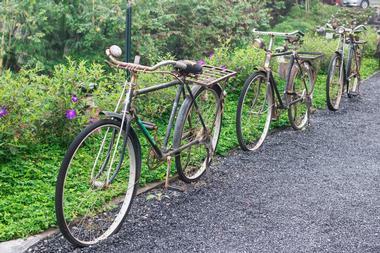 It is an inexpensive way to get around the city and see its attractions as well as the beautiful views along the way. There are designated bike lanes on the main streets, on biking paths along scenic routes, and on wooden boardwalks. There are several bike rental companies here and there in San Juan. Rent the Bicycle is a rental company located at the entrance of Old San Juan’s bayside waterfront. 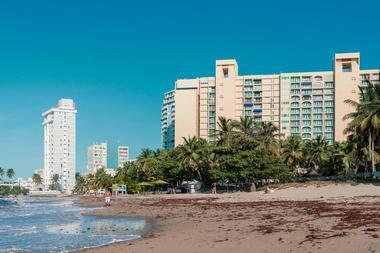 Paradise Rentals has two locations: Old San Juan at Pier 2 and in Condado at Condado Village. There are several other ways to get around San Juan. There are many taxis and these operate on a flat-rate system: this can come in handy if you are stuck in a traffic jam. Taxis are usually found in front of the island’s hotels; or you can ask a staff member to call a taxi for you. 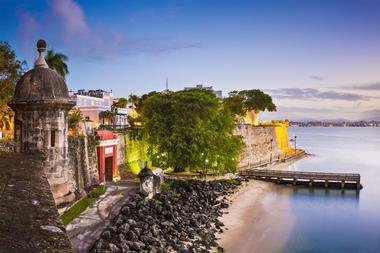 There is only one way to explore Old San Juan and that is by foot: you can see all of the major attractions in one day. If your feet get tired, leave Old San Juan and jump on a trolley. These are free and they pass by historic areas. The Acuaexpresso is a ferry connecting the city with Catano across the bay. As one of the largest cities and one of the most popular tourist destinations in the Caribbean, San Juan offers a wide range of dining options: this comes mostly from the island’s diverse cultures. Seafood and fish play a big part in Puerto Rican cuisine: red snapper is a local favorite, but non-local options such as salmon and Maine lobster are also popular choices. In addition to local food, there is a huge selection of restaurants serving ethnic cuisine such as Chinese, French, Indian, Italian, Japanese, Mexican, Middle Eastern, and Spanish. A favorite spot for locals are the panaderias, or bakeries, where breakfasts are served as well as lunches and dinners. With all the visitors coming and going by airplane and by cruise ship, it is no surprise that the shopping scene in San Juan is hopping. 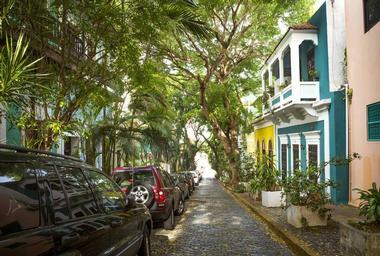 Some of the best shopping is in Old San Juan: major shopping streets here are the Calle Fortaleza, the Calle del Cristo, and the Calle San Francisco. What to shop for? 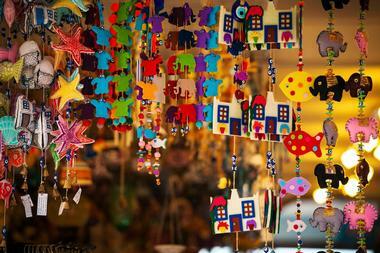 There are native handicrafts like ceramics, hammocks, needlework, and papier-mache fruits and vegetables. Paintings and sculptures by local artists are popular shopping items as well as “santos.” These are religious statues of saints hand-carved out of wood. The Plaza Las Americas is a large shopping mall with more than 200 shops and restaurants. 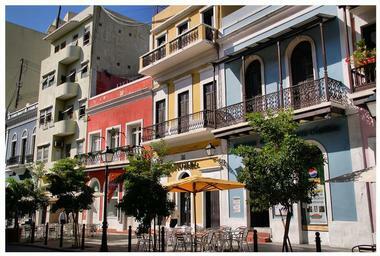 San Juan is divided into several neighborhoods and the most popular of these is Old Town. It is full of beautifully restored Spanish colonial houses and fortresses all set on a headland overlooking the turquoise water of the Caribbean Sea. East of the old city walls is an area called Puerta de Tierra. Originally established by freed black slaves, today it contains many government buildings as well as the Luis Munoz Rivera Park and the El Escambron Public Beach. Miramar is a wealthy residential neighborhood with a small business district and a marina. Condado is an area with the oceanfront Window of the Sea Park at its center: this is a development with residences, shops, and restaurants. San Juan is a perfect place for a wedding: it has historic buildings, fortresses, beaches, beautiful seas, churches, and incredible views. 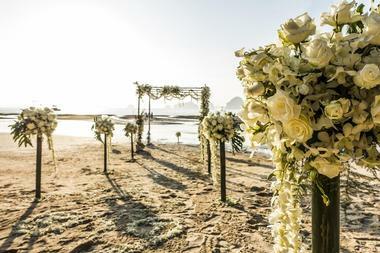 Popular hotel wedding venues include the La Concha a Renaissance Resort, the Condado Vanderbilt Hotel, the Ritz-Carlton San Juan, the Wyndham Grand Rio Mar Beach Resort and Spa, and many more. W Retreat Vieques Island is set on the island that is just minutes from San Juan. If you are interested in a church wedding, San Juan Cathedral in Old San Juan is a good choice. 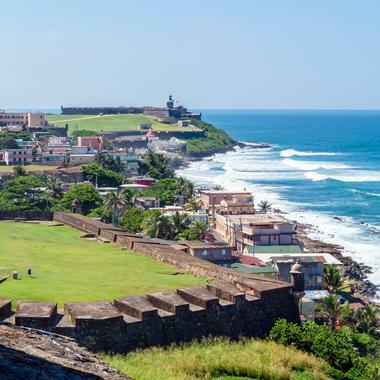 There are several historic forts that make great wedding venues because of the ambience of the forts and the incredible views: these forts include San Cristobal Fort and El Morro Fort.